Stevia is an artificial sweetener made from the leaves of the stevia rebaudiana plant. It is sweeter than sugar, so less of it is needed to sweeten foods. Although it is safe to consume during pregnancy and may even help you avoid gaining unnecessary weight, only your doctor can help you determine how much artificial sweetener you should have. Stevia that has been processed and refined is considered safe for its intended use during pregnancy. According to Drugs.com, stevia consumption has been studied in rats and showed no adverse affects on gestational growth. 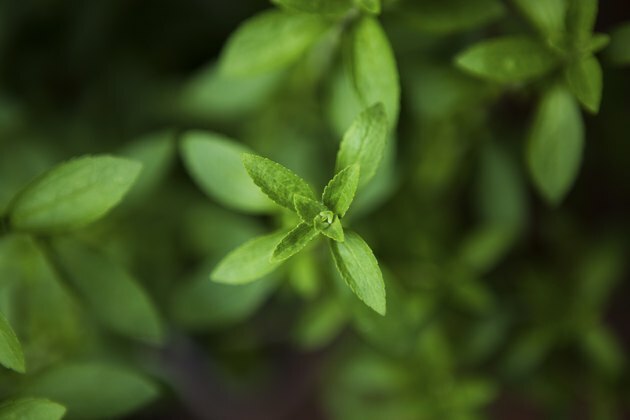 The U.S. Food and Drug Administration states that stevia extracts and whole leaf stevia have not been approved for use, so be sure to only use the processed version found in foods. Talk to your doctor about a safe amount of stevia to consume during pregnancy. Stevia is frequently found in soft drinks, candy, jam and desserts like pudding. These are all items that you should limit during pregnancy to avoid weight gain. However, if these items are made with stevia there is a reduced risk of them affecting your blood sugar levels.Stevia is also used in drink mixes and dairy products and as a sugar substitute when baking products like cookies or cake. Food products that contain stevia will list it on the label, so check the product information if you are unsure which type of sweetener it contains. Stevia is a zero-calorie sweetener, so it is often used as a sweetener for those trying to lose weight. However, to avoid unnecessary weight gain during pregnancy, you also need to follow a healthy, balanced diet that includes protein, whole grains, fruits and vegetables. Many sweets that contain stevia can also be high in fat, so make sure that you are only consuming stevia as part of a healthy diet. Keep in mind that natural sugar is safe to consume during pregnancy as long as it is consumed in moderation and does not contribute to unnecessary weight gain. Although stevia does not contain calories, choosing artificial sweeteners during pregnancy is not always better than natural sugar. Your doctor can help you determine the best type of sweetener to include in your diet based on your current eating habits, weight and overall health. U.S. Food and Drug Administration: Is Stevia an FDA approved Sweetener?